Trey Davis, the Preserve Manager at The Nature Conservancy’s Tensleep Preserve, described Tensleep as “a place of superlatives.” Everything at Tensleep is the oldest, the most diverse, the most valuable to researchers, and yet in order for those superlatives to remain true the place must also remain relatively unknown and untouched. My explorations of the Tensleep property with Trey and the Assistant Preserve Manager, Josh Criswell, were intimate and powerful experiences–an inside look into the underlying natural and historical processes at play on this vast nine-thousand acre landscape. Tensleep was so important to my research this summer because of the careful considerations being undergone to evaluate Tensleep as a potential site for native cutthroat trout reintroduction. The trout that inhabit Tensleep’s immaculate stretch of Canyon Creek are, in all their beauty, nonnative. Trey and others in the Cody Region have identified the potential for native trout reintroduction in Canyon Creek on the Tensleep Preserve, but are particularly concerned with Canyon Creek’s unique hydrology and entomology. Canyon Creek actually flows underground in two sections on the property (areas known as “sinks”), once through a cave system on the northeast end, and again downstream in the central stretch of the canyon. For all anyone knows, there could be yet undiscovered and rare species of macroinvertebrates in and around the sinks, macroinvertebrates that may suffer with the introduction of piscicides to eradicate existing nonnative trout. Active management on the property, as with any conservation project, comes with unintended consequences and trade-offs. I journeyed down to the lower sink along the Ponderosa Trail one late-May morning with Josh Criswell both to help turn off a few valves and to get a better sense of the landscape. I followed Josh and his excitable new dog, Bear, down the faint hint of a trail into the lower end of the canyon. Most of TNC’s trails on the property are similarly opaque–a sign of Trey’s and Josh’s relatively hands-off style of management. While Tensleep is open to the public regularly, the Tensleep Preserve is no longer the enormous operation that it once was, complete with more than a dozen managers, naturalists, cooks, and janitors. Trey and Josh now quietly manage the land for the land’s sake, encouraging but not laying out a red carpet for their visitors. That day, the river was so rapid and swollen from the rains that the lower sink was no longer sunken. Josh tossed Bear into the river with a grunt and soon followed himself, boots and all. We crossed back and forth with the same exuberance, dipping our heads in the stream to stave off the nearly tropical heat of the inner canyon. 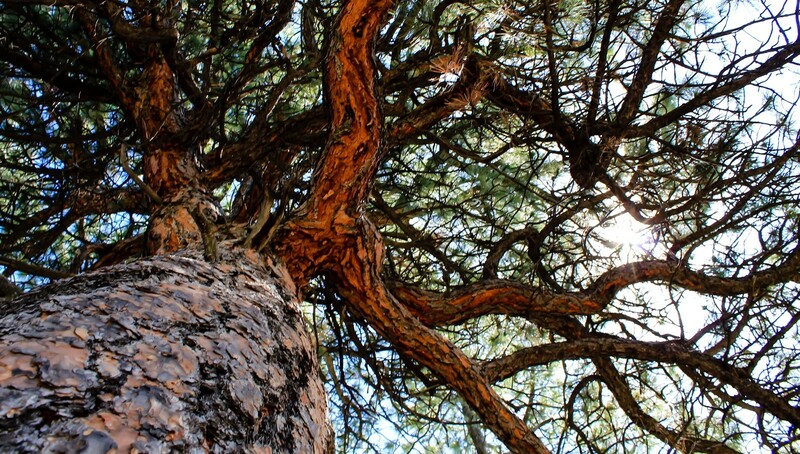 We walked among the great Ponderosas and talked of conservation, change, and place. My interest in trout conservation took me beyond the boundaries of Tensleep, as well. I took a brief road-trip from KOA to KOA west into Cody, through the Eastern Gate of Yellowstone and out through the Northern Gate, into Bozeman, MT, and back east into Tensleep from the north. In Cody, I met with Sam Hochhalter from the regional office of Wyoming Fish and Game in Cody along with the rest of their “Trout Team,” picking up insights from the Cody Cutthroat Collaborative and their series of public comment sessions surrounding native trout conservation. 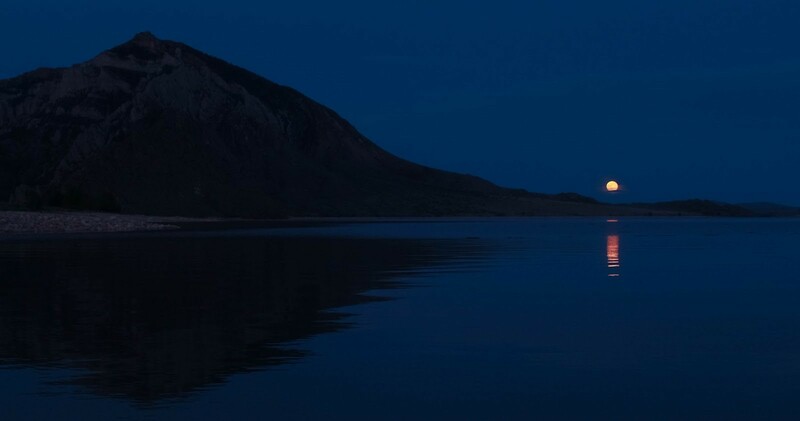 I chatted with locals in Cody coffee shops, picked up a few Larry McMurtry novels, and camped on the shores of the Buffalo Bill Reservoir near the Eastern Gate where I watched the moon rise blood-red in the twilight. 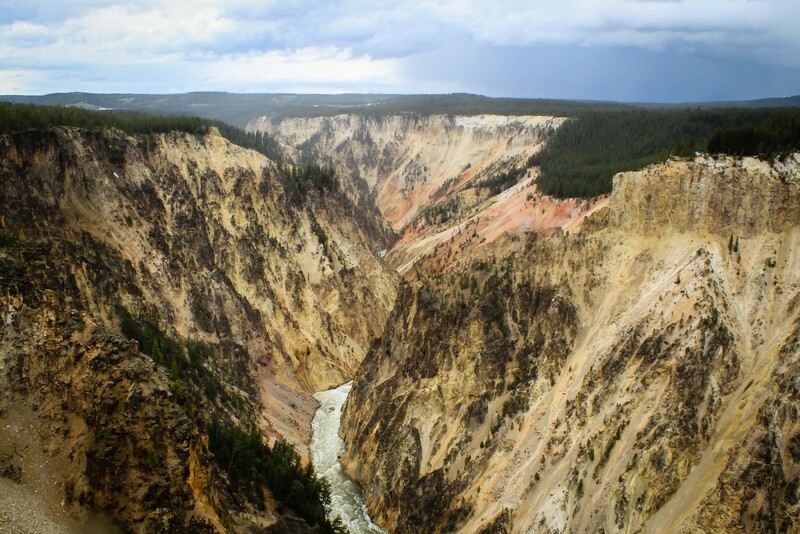 I raced through Yellowstone in only one short day, journeying on foot from Artist’s Point to “Point Sublime” where I flexed my amateur landscape photography abilities and weaved in and out of tourists’ family photos. I camped again in Paradise Valley, retracing my steps from my “Yellowstone and Global Change” seminar the semester prior, and met with Mountain Journal editor-in-chief Todd Wilkinson over coffee in Bozeman, MT the following morning. We talked trout, too, about the greater native trout controversy brewing at French Creek and the broader meaning and relevance of conservation today. I returned to Tensleep for my final week exhausted and brimming with new knowledge, finally prepared to ask the questions I had been mulling over and formulating since my arrival. My time with Trey, Tensleep’s gravitational center, was too short to do much more than scratch the surface, but our nature walks and conversations tied together many of the strands I had been tugging at in my time on and off the property. On my walks with Trey I was joined by Josh Perez-Cruet, another Western Resources Fellow doing the on-the-ground entomology surveys for Trey, and I was incredibly grateful that I could spend my last few days at Tensleep with another soul other than the marmot incessantly burrowing under the Wilke’s Cabin floorboards. Trey’s role at Tensleep is multi-layered: naturalist, interpreter, resident, publicist, ecologist, and more. Trey’s two decades living and working at Tensleep are self-evident. As we walked, Trey pointed out canyons and draws that he himself had named, places christened for the stories and memories created with his wife and daughter. Trey’s daughter was raised by and on the land, navigating it with the same natural ease as her father. Trey has backpacked nearly every square inch, ventured into the cave system at the upper sink, and buried past canine companions all on the same land. It was a rare joy to learn from someone with such a profound love and reverence for a place, along with an inclination towards education and interpretation. This entry was posted in Botany, Fish, People, Water, Western Research Fellows, Western Resource Fellows, Wildlife, WRF 2018 and tagged Franklin Eccher. Bookmark the permalink.